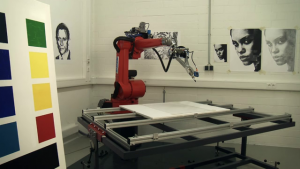 2016 RobotArt Contest is first of five annual challenges that hope to inspire the creation of true artificial creativity. Seattle, Washington, January 27, 2016 (Newswire.com) – ​​​​​In the tradition of recent Technological Grand Challenges, RobotArt has pledged over half a million dollars in prizes over 5 years to competitors in a new Robotic Grand Challenge. This Grand Challenge is simple to describe but difficult to master, create a robot that paints with a brush like a classical master. The more skilled and creative the robot, the better. With a deadline to submit artwork on April 14th, a dozen teams from around the world have already committed. Notable entries include multiple alumnus of the DARPA Grand Challenges that ultimately saw the successful creation of self driving cars including Carnegie Mellon, Cornell, UC San Diego, and Purdue. Notable international competition comes from Canada, France, Germany, and India. The two categories represent competing world views currently held by technologists working in the field of artificial creativity. Engineers interested in the Telerobotics Category typically see machines as collaborators with humans. When asked about why she preferred telerobotics, Yeliz Karadayi of Carnegie Mellon University responded. Credit: University of Konstanz, and eDavid’s creators.